For over 25 years, National Development has been one of the top real estate development and property management firms in Massachusetts. As an early adopter of Wired Certification in the Greater Boston Area, National Development addressed a growing challenge for today's CRE tenants: reliable, high-speed Internet connectivity. 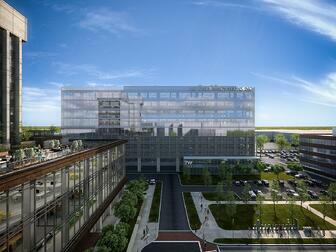 National Development has recently achieved Wired Certification for over 3M sq ft of commercial real estate in Boston. The 34 Wired Certified buildings – located in Boston, Bedford, Burlington, Charlestown, Foxborough, Framingham, Medford, Woburn, Westborough, and Westwood – are among the region’s most desirable office spaces, including The District Burlington, Unicorn Park, and Constitution Center. Strong connectivity has never been more important to commercial tenants than it is today and demand for well-connected offices is only growing as the Boston tech community continues to thrive. Beyond the tech sector, tenants in finance, consulting, and other industries are more reliant on reliable, high-speed internet than ever before. By certifying over 30 buildings in the Greater Boston Area, National Development has committed to providing all tenants, from the CBD to suburban hubs, with the resilient connectivity businesses need for success. To achieve Wired Certification, properties must meet rigorous standards developed in conjunction with the top minds in the tech and commercial real estate industries. These standards include the number and quality of Internet service providers, bandwidth capabilities, and the reliability of connections based on the building’s infrastructure.